Some exceptional performances and amazing matches were witnessed today in the quarterfinals of the French Open 2018 in which Rafael Nadal and Juan Martin del Potro from Men’s Tennis booked their place into the semifinals. Result: Rafael Nadal defeated Diego Schwartzman at the French Open by 4-6, 6-3, 6-2, 6-2. An exceptional performance was seen today on the clay court between the Spaniard, Rafael Nadal, and Diego Schwartzman in the quarterfinals of Roland Garros. The match was suspended yesterday due to heavy rain but continued today at Philippe-Chatrier court with Diego leading Nadal by one set. Nadal with his forehand skills won the last point of the set and now the sets were equalized 1-1. Soon the third set started and Nadal took the lead in it. Schwartzman struggled hard to recover the points but failed to do so. At last, Nadal with his brilliant playing style sealed the victory over Diego and won the set by 6-2. It was a great comeback from the Spaniard as he was down in the previous sets. Moreover, this win was a sigh of relief for him as he only needed one more set to win. After a short break, the fourth set started and it looked that Schwartzman could win this set as he took the lead in a very less amount of time. Rafael soon recovered the lead and won the set after a tough fight with his opponent and made it into the semifinals, where he will play against Juan Martin del Potro of Argentina. Result: Juan Martin del Potro defeated Marin Cilic by 7-6(5), 5-7, 6-3, 7-5. Exquisite and absolute performance was witnessed by the crowd as the Argentinian, Juan Martin, defeated Marin Cilic. This match was also suspended yesterday due to rain and resumed today at 6-6 on the both sides. After some minutes the score was tied again and the first set came to a tie-break. Juan Martin struggled hard and after a tough fight against Cilic, he won the first set. After some time, the second set started and Marin Cilic took the lead this time with 2 points upfront. Juan recovered the points after some time and the score reached 5-5. But Marin eventually sealed the victory by winning the set from 7-5 and equalized the sets 1-1. The third set started and this time Juan took the lead. 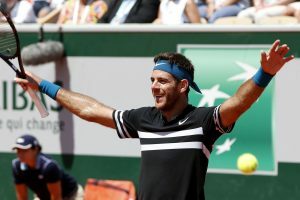 No doubt that both the players were gaining points immediately one after the other, but Martin del Potro didn’t let the Croatian to recover the points and won the third set by 6-3. Now it was all down to the fourth set for both the players. As the set started Marin took the lead but who knew that Juan Martin will recover the points after struggling hard which he did and won the set by 7-5. At last, Juan Martin del Potro booked his place into the semifinals of the French Open 2018 where he will face the Spaniard, also known as god of clay, Rafael Nadal. Join allsportspk, for the Day 13 of the French Open 2018.